Having entered the month of May, the world outdoors is getting greener and greener by the day, and spring flowers are everywhere in bloom. 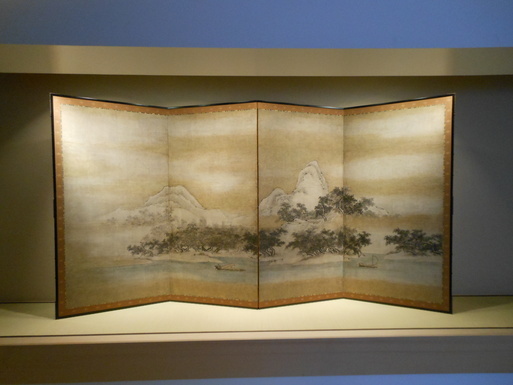 Though not in line with the season, at the Shirokane gallery now we are exhibiting the screen Mid-winter Landscape, which is a work of the Unkoku school- a large school of painting like the Kanō school that followed the style of Sesshū. 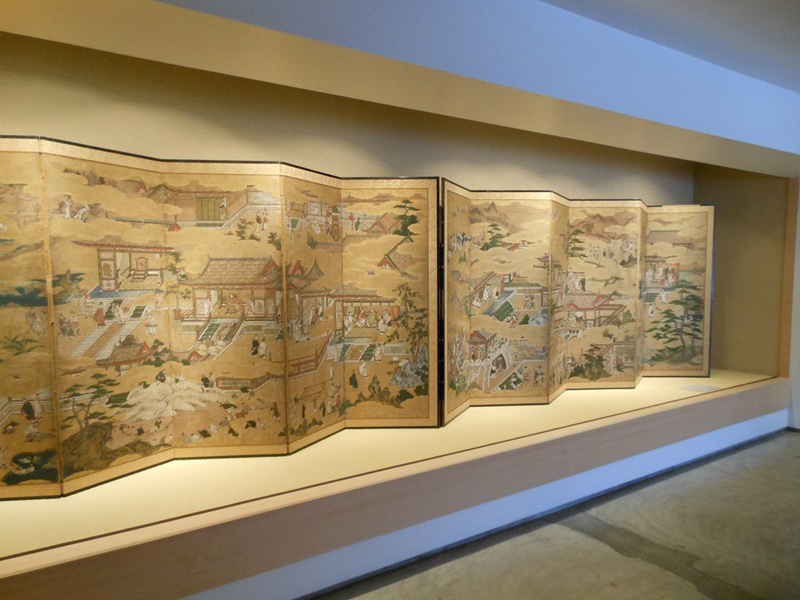 The Unkoku school flourished in the Momoyama period, and followed a Chinese style of painting. 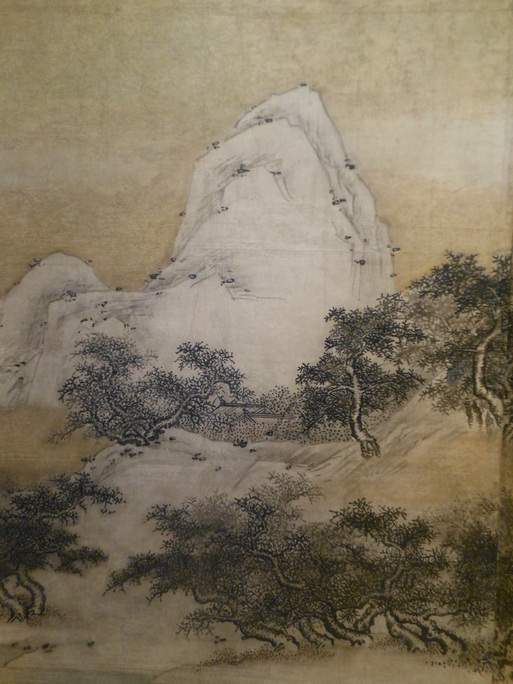 They are also called the Sesshū school, and claim to be the direct successors of Sesshū's painting tradition. The school's work could be said to be characterized by the perfectly straight lines of the building rooftops and the strongly contrasting use of deep ink tones in trees and rock formations. While simple, it is an extraordinarily powerful work, and gazing upon it brings a certain sense of peace to the heart and soul. We would like to announce that both galleries in Roppongi and Shirokane will be closed during the Golden Week Holidays, from Sunday April 29th to Monday May 7th. Opening hours will return to normal as of Tuesday May 8th. We hope that you enjoy the holidays, and we look forward to seeing you again in the near future. 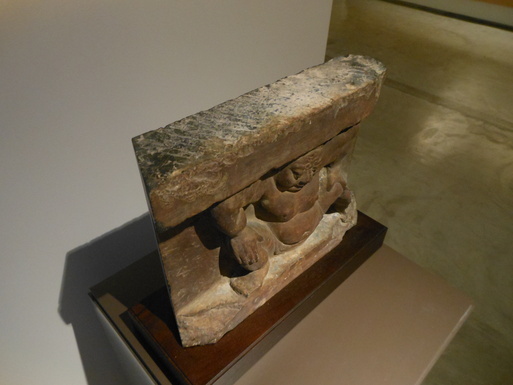 This is part of what is thought to have been an eight-sided caryatid (pedestal or base for an architectural column or sculpture) featuring a crouching monster with a human head. It dates from China's Northern Qi period (550 - 577), and is thought to have come from the Xiangtangshan caves. 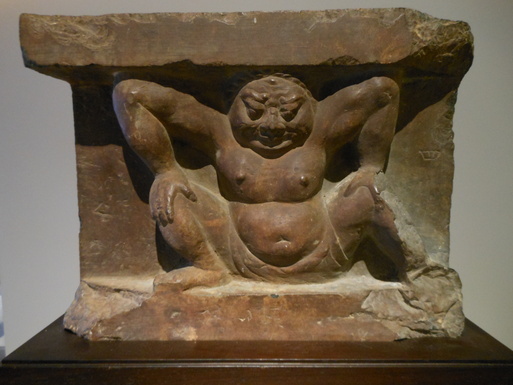 His posture and rounded form lead many visitors to the gallery to think that it may have been a guardian figure of some kind, but it is perhaps best to think of it as one of the small imp or demon-like figures that are often seen beneath the feet of Buddhist sculptures of Deva Kings. Though you might expect a figure like this to have a frightening expression, he seems as if he is almost cracking a slight smile. If there were in fact originally eight sides to the base that this formed part of, I would love to see all of them assembled together. I hope that you will come by the gallery to see this charming little monster for yourself! Thank You For Coming To "SHUFFLE II"
We hope to continue in other events like this looking forward into the future. Also, there has been a partial rotation in the works on display at London Gallery in the Shirokane Art Complex, which will be viewable from April 5 to April ９. In further news, on Saturday April 14 there will be a collaborative opening of all of the galleries at the Shirokane Art Complex, including the new gallery on the second floor, ARATANIURANO.